May has brought us a flourishing set of projects – we can browse from the dark passages of White Scar Cave to the skies with Air Transat’s website. Summer is ahead of us, so don’t be shy – surf the wave of its glorious energy! Implemented by r42 communication Inc.
Air Transat is a Canadian intercontinental airline based in Montreal. It is one of the largest integrated tourism companies in the world and Canada’s leader in holiday travel. It operates scheduled and charter flights, serving over 60 destinations in 25 countries. 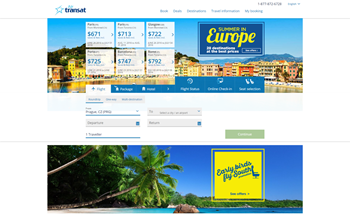 r42 was given carte blanche for their creative ideas, and its team designed a new booking engine, used high-resolution images to entice and inspire users, implemented custom fonts, and injected a series of different tiles to display Air Transat’s offering. The site needed to meet WCAG 2.0 Level AA compliance, which requires every step of the development process to be accessible. The site is a fully responsive and multilingual e-commerce airline and vacation travel site with a complete reservation and after-sales process. The immediate feedback includes no drop in search engine ranking and a satisfied group of webmasters. 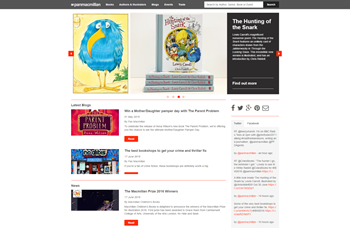 In existence for over 150 years, Pan Macmillan UK is one of the largest general book publishers in the UK and, as a part of the Macmillan Group, operates in over 70 countries worldwide. The first goal of the site was to increase the conversion rate, specifically the number of visitors buying books online. There was also an emphasis placed on site visitor engagement via participating in the blog, reading book extracts or learning about the authors. The website integrates with Twitter and Facebook as well as other third-party feeds featured on the website. Kentico’s E-commerce functionality is used extensively, with over 12,000 SKUs. This is possible with the help of Kentico EMS features, such as A/B Testing, MVT Testing and Content Personalisation. The website is hosted in a load-balanced, scalable Microsoft Azure environment, giving the client the peace of mind that they can cope with large spikes in website traffic. 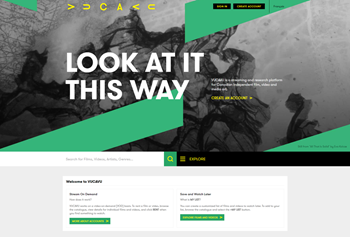 The Canadian Coalition of Independent Media Arts Distributors' (CCIMAD) mandate is to showcase Canadian media arts and artists to a global audience. CCIMAD engaged ecentricarts to design and build an eCommerce and streaming media platform that drives revenue through rentals and subscriptions of online streaming media content, and allows for easy media management and publishing for its eight coalition members organizations. 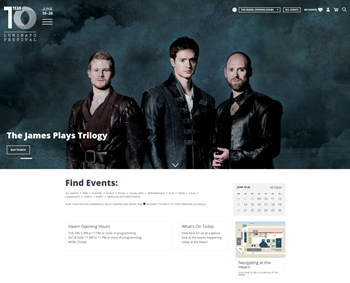 The platform, VUCAVU.com, is an innovative streaming media and eCommerce platform - a mashup of Netflix and iTunes that showcases Canadian media arts and artists to the world. It empowers Canadian media arts distributors to monetize media arts content through rentals and subscriptions of online streaming media arts content. 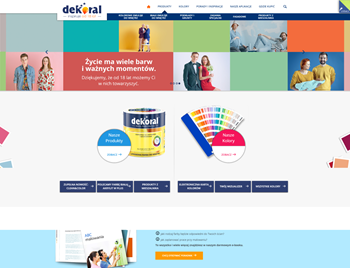 Dekoral—a PPG subsidiary— is a Polish brand of paints and enamels. They needed a website that would attract visitors by using a rich palette of colors and an instinctive user journey. The search engine allows visitors to view the color of various collections, products, or names. Moreover, the Tips and Inspiration section contains useful video materials. The site is built on Kentico and utilizes an MVC approach. The core feature of the whole solution is Kentico Synchronization Tasks, which automated the process of content management and can be managed in one central database to be able to replicate it among different brand websites. This has resulted in very low maintenance costs. The content management process is faster, easier, and intuitive, even for non-technical editors. The Dekoral project has been met with positive customer feedback and is overall very successful. Cleveland City Council asked thunder::tech to assist in migrating them to a new CMS and designing a more intuitive, responsive experience for their website that serves their constituents, media, and council members. The incorporation of the Cleveland Ward Map, which layered GIS KML and Google Maps API data on top of the city, allows for visitors to locate addresses intuitively within wards and various landmarks. 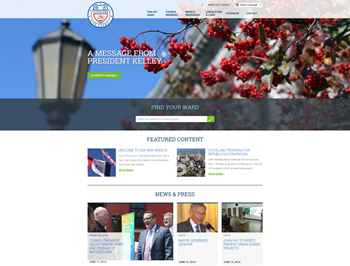 The new website needed a modern look and feel to demonstrate the professionalism of the City Council efficiently, as well as communicate stories going on in the 17 wards throughout the city to the wide-ranging audience. After the launch, there has been an increase in requests for information and contact form submissions for each City Council member via their own unique landing page. Among other Kentico features used are Custom Workflows for governance and editing approvals, Custom Templates, and Custom Widgets. The Luminato Festival is Toronto’s global multi-arts festival and one of the preeminent arts festivals in North America, dedicated to performance, visual art, music, theatre, dance, magic and more. This year’s 10th anniversary festival will be held at The Hearn Generating Station for the first time ever, further supporting the festival’s mantra of “delivering adventurous art in adventurous places”. Working closely through a truly collaborative effort with Luminato’s talented marketing and digital teams, the end result of this project is a bold and innovative website that celebrates the amazing world-class, multi-arts event that is the Luminato Festival. Developed on Kentico CMS and integrated with Spektrix’s online ticketing system, the website includes a custom event scheduler with a conflict resolution engine to help festival-goers plan their personalized festival schedule. Under a shortened timeline, digital agency Ntara partnered with Simmons to redesign Beautyrest.com and provide an improved user experience. 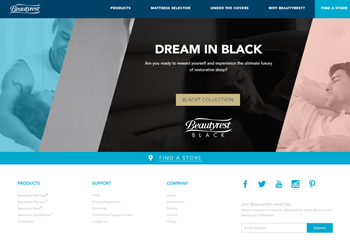 The newly designed site drives users to Simmons’ retail locations while continuing to build the Beautyrest brand. The site utilizes a mobile-friendly, responsive design and there are considerable unique social integrations with a custom module for product data. After its launch, the site saw a 35.2% increase in dealer location conversion, a 71% increase in conversions from social networks, a 16.6% increase in overall sessions, and 6% improved average session duration. Since 1870, Simmons Bedding Company has set out to build comfortable mattresses. Simmons was the first company to introduce the king- and queen-size mattress, and it continues to innovate today. 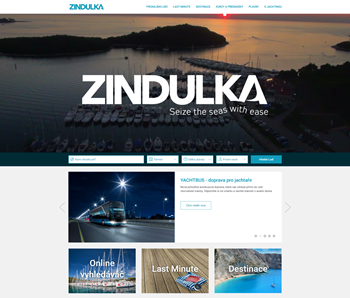 Zindulka is one of the largest Czech yacht charter agencies and has been on the market for almost 25 years. With this project, the new website—built on Kentico EMS—needed to be integrated with the Salesforce CRM to provide additional data about leads and customers. The result of this connection is a fully automated reservation process that makes the work of operators easier and gives them a deep understanding of end-users. Zindulka provides site visitors with a fast and easy way to search for the right charter based on attributes crucial to each individual. The number of steps to reserve a boat has decrease 35% fewer pages. As it is possible to collect and manage payments by cards or bank transfer through the website, 80% of reservations are made directly. The responsive solution provides users and visitors with comfortable UX. In May 2016, in a year-on-year comparison, page visits grew internationally by 41%. Newcastle Building Society is the biggest building society in the North East of England, with assets in excess of £3.4 billion. Kentico is easy for their non-technical staff to use, maintain and update, and it’s flexible enough to meet their requirements. Kentico has a published roadmap and, best of all, has the EMS to satisfy all of the client’s personalisation goals for a truly customer-focused solution. NetConstruct designed and developed numerous financial calculators, and the whole website is customized to comply with complex financial guidelines. 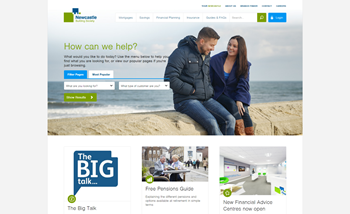 NetConstruct worked with Newcastle Building Society to implement a robust and scalable hosting solution utlising the built in web farms and content staging capabilities of Kentico. Since the redesign, there has been a 70% increase in visitors, a 25% increase in the number of logins due to the improved UX and much faster page load times. The need for a digital presence influenced even this treasured place of natural beauty and geological heritage. White Scar Cave, the longest cave tour in Great Britain, needed to get closer to its visitors, drawing attention and driving ticket sales. 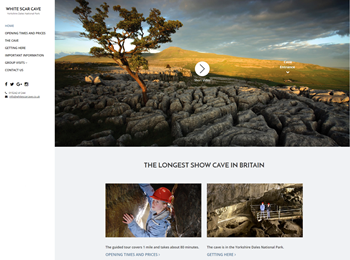 To achieve this, the new website needed to communicate the history of Scar Cave and provide catchy content accessible from all devices to a range of users across varying demographics, including schools, cavers, families and other groups. The website’s mobile-first approach follows the philosophy of “less is more” and delivers content quickly and in bite-sized chunks. Users have access to information about the cave, why they should visit it and how to get there. Since the site’s launch at the end of April 2016, the new website has delivered promising improvements, including a 21% increase in conversion rates, a 37% increase in user engagement and an 8% increase in visits. The new design has put the new Apprenticeship Careers Australia brand at the forefront by following fresh user interface trends. Finding jobs cannot be easier than with this job board. 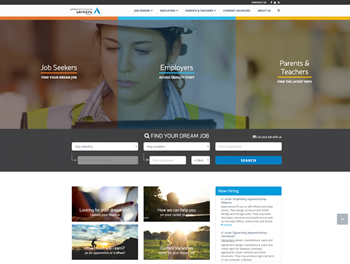 The Apprenticeship Careers Australia website was created as part of a major re-brand for a large Australian recruitment company. The goals of the redesign included improving the number and quality of leads coming in from the website. One of the project’s main challenges was to ensure the new design put the brand at the forefront of current design and user interface trends. The new site utilizes Kentico EMS features, such as Campaign Management, Contact Management, and Marketing Automation. A custom filter web part was developed to allow users to search and a custom form web part was used for job applications. All job data (including data in various filters) is stored in custom tables. The new site averages over 90% more traffic than the previous version of the site. Also, the number of job applicants has more than doubled, with the company experiencing a huge increase in the number of resumes received.